Let’s face it – no matter how carefully you handle your discs, they will eventually get dirty. For that matter even brand new discs aren’t perfectly clean. And playing dirty discs results in an unnecessary loss of quality. For this reason, Canadian company Eden Acoustics is now importing high quality cleaning and conditioning disc solutions from Ukranian manufacturer Chisto. The Disk Analoguer solution promises to make CDs sound analogue and DVDs show in full colours and sound. It is said to be an absolute must have for Blu-ray disc due to their high data density. Application is simple. Spray from bottle on disk surface and wipe off with included Evolon cloth until dry. Magic? Not exactly. Because even new disks are dirty and covered with MRA (Mould Release Agent) . So reading errors, so extra stress on your DAC, so digital artifacts and irritating sound. Chisto also recommends using the cleaning solution for Playstation, Playstation 2, Playstation 3, XBOX, XBOX 360 and Wii discs. 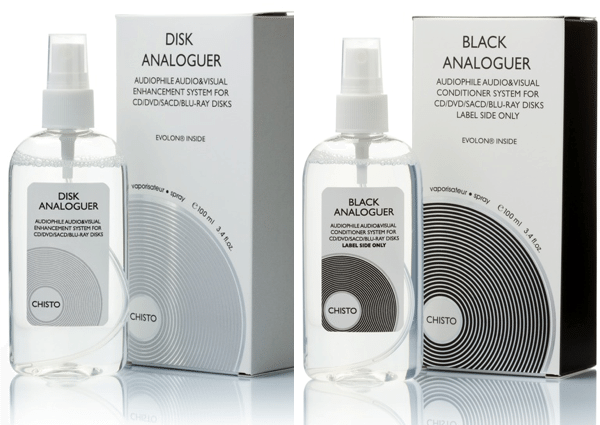 The Black Analoguer is a perfect companion to the Disk Analoguer, designed to be sprayed on the disc label side only. It is said to reduce static charge and make CD and SACD discs sound analogue, and show DVDs at their full potential. Simply spray from bottle on label side and wipe off carefully with included Evolon cloth until dry. Why does it work? Because disc drive electronics are very sensitive and any small improvement here will benefit playback performance. The Disk Analoguer and Black Analoguer and available now for $45 CAD each. For more info, please visit http://chisto.me. For Canadian availability, please contact Eden Acoustics at info@edenacoustics.com.